We spend our lives raising, nurturing and protecting our children. But when it’s time to retire, sometimes we need to protect ourselves FROM the kids. 70% of 65- to 74-year-olds held some debt. College costs are at an all-time high. Millennials are likely to move back in with Mom and Dad after college. 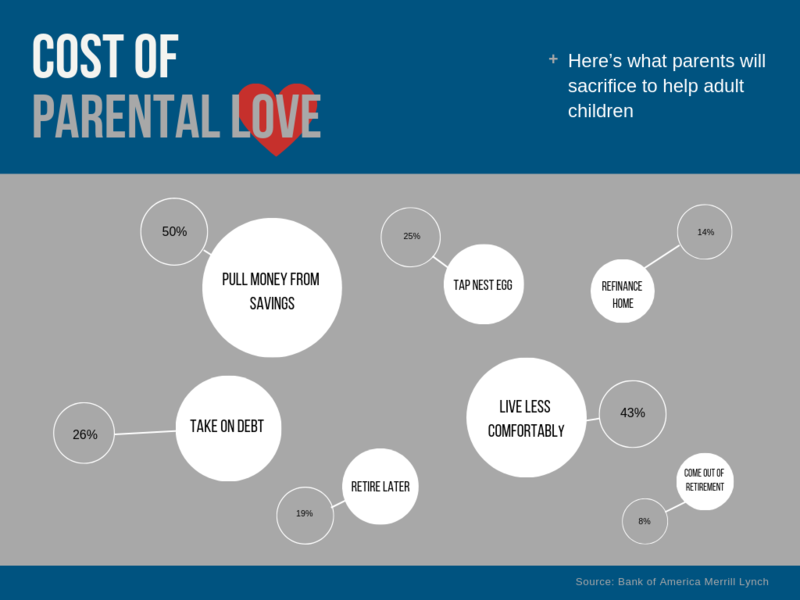 Parents are sacrificing savings and living less comfortably in order to help adult children. The financial support goes beyond college, extending into daily costs of living, down payments, and cars. Parents tend to spend twice as much on their adult children than they contribute to their own nest eggs. A better option would be to tap a taxable account, since capital-gains taxes are lower. For parents with resources but not liquidity, Angie O’Leary, head of wealth planning for RBC Wealth Management in the U.S., says some clients can leverage their stock portfolios through a securities-based line of credit, or non-purpose loans. Unlike the margin loans used to buy stock, these are tied to the London interbank offered rate, a global interest-rate benchmark, and are less costly than federal parent PLUS loans. Another way to protect yourself is through an annuity. Many people complain that annuities have surrender penalties and are generally illiquid. But with adult children draining your resources, this may be a situation where those attributes are a good thing. Here are two scenarios of how it might help. First, if your children tug too hard on the heartstrings and you risk shortchanging your own financial future for their comfort today, consider a fixed-income annuity for yourself. This is a way to safely protect your principal and force financial discipline. If the money is spent on the purchase of an annuity, it can’t be spent on other things. Another example is to enforce financial austerity on the children with a fixed income. Buying a period certain guaranteed income provides a fixed period of support that can’t be accelerated or dissipated- it’s the equivalent of an allowance. For the parents who want to bite the bullet, and make a ‘one and done’ decision to support an adult child for a period of time, this is the way to go. Many may see these as draconian measures, but there are many families with unhealthy and even toxic financial relationships. Using period certain payment streams like a secondary market annuity may just be a way to save a family relationship by turning assets into reliable income.